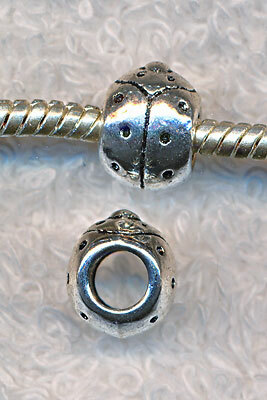 This large hole bead fits most European Style chains, charm bracelets, or necklaces. Ladybug Symbolism - The appearance of a ladybug heralds the coming of luck and the fulfillment of wishes. Ladybugs symbolize Delight, Happiness, Joy, Wishes and Trust. The number of spots on a ladybug's back is supposed to represent how many days (or months) until you get your wish. Another tradition holds that if you catch and release a ladybug, it will fly straight to your true love -- and whisper your name in his or her ear.